I am so happy it’s the unofficial start of summer! Getting dressed up this time of year is my absolute favorite, and what better way to kick it off than in a feminine white romper? Today’s post is another collaboration with Liberty Center (check out my fitness post here), and it’s all about summer! Since there are so many great stores to shop at, I knew the summer fashions would be plentiful, and they did not disappoint. My mission was to find an outfit that epitomizes summer fun, so my first (and ultimately my only) stop was at Dillard’s. I actually just went on an unintentional shopping spree at the Liberty Center Dillard’s a few weeks ago (no regrets! ), so I already knew there’d be some summer goodies to fit the bill. PSA: if you have never been to the Liberty Center Dillard’s, please go immediately! It’s the largest and most beautiful Dillard’s I’ve ever shopped in, and you won’t want to leave once you’re there. Honestly, my biggest challenge was narrowing it down to just one look. There was a little bit of everything you’d want for summer: bright colors, jumpsuits, crop tops, midi dresses, bold prints, etc. I loaded up on pieces to try on, but I made an instant connection with this ruffled white lace romper from the Chelsea and Violet line at Dillard’s. There were just too many feminine aspects that I couldn’t resist. 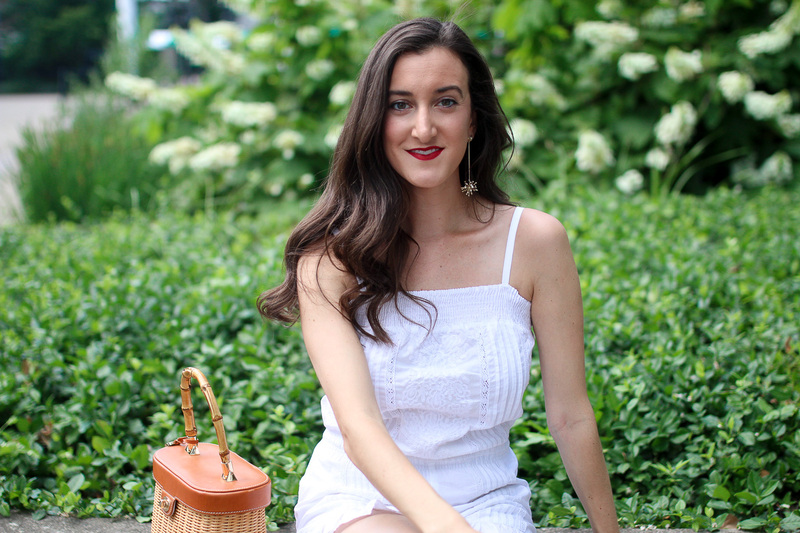 What says summer more than a fun and flirty white romper?! I love that this romper is fitted, but has an elastic waist and neckline, making it incredibly comfortable and easy to move around in. There are so many ways you can wear a white romper, whether it’s for an easy daytime look or to dress it up at night. Today I’m sharing a dressier interpretation by pairing it with a pair of brown espadrille wedges, some fun gold statement earrings, and a summer handbag. I have a feeling this is going to be my most worn item in my closet this summer! This post was sponsored by Liberty Center, but as always, all opinions are my own! You look so pretty, Olivia! I love all the cute little details on that romper – it’s so adorable and totally perfect for summer (love those heels, too)! And I’m so sad because there’s no Dillard’s near me in Chicago and it’s one of my favorite stores! This romper is SO cute, and I love how you’ve styled it! That shopping center sounds fun.